Man, have I been in a fish taco mood lately. Which works out well for the Southern husband who loves fish tacos, and is very happy that I am not in, say, a brussels sprout mood or a chicken liver mood or a couscous mood, all things that I love but he doesn’t. But fish tacos he is happy to eat night after night, which we did until I got things down to my two favorites…the quick and scrumptious grilled fish tacos I wrote about the other day, and these light and delectable fried fish tacos. 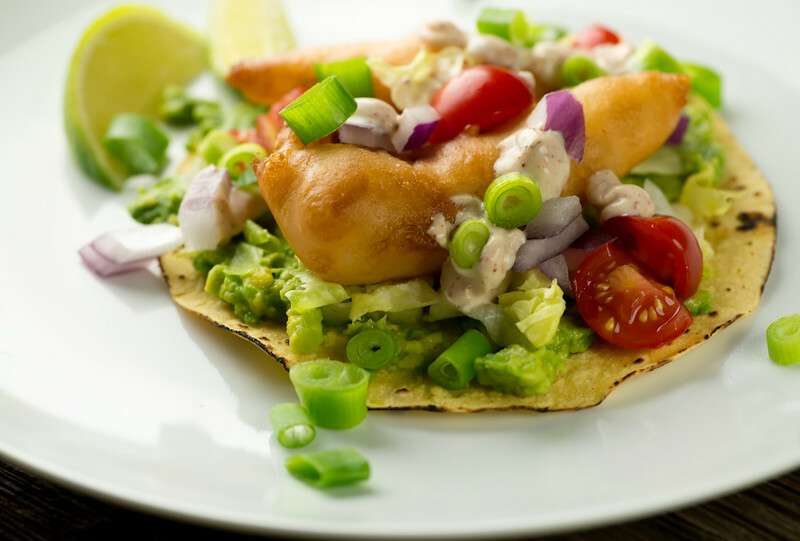 And while we did adore the grilled fish tacos….these fried ones? They are the grand prize winners in my house. Two things I love about them? You don’t need any fancy deep frying apparatus for these…a heavy deep pot and some canola oil will do you just fine. And you aren’t going to end up with anything heavy or greasy…these cook up for about 5 minutes in a gentle airy batter that is crispy and light and perfect. I like to toast my corn tortillas over the gas burner while the fish is cooking, just to give them a little char. As with the grilled tacos, I spread the tortillas with a little mashed avocado, and I add in some chopped lettuce, a few cherry tomatoes and a scattering of scallions for zing. A little sour cream laced with chile powder for a topping, a squirt of lime juice and about 20 minutes after we walked into the kitchen we were tucking into some warm and wonderful fish tacos. This concludes our fish taco experimentation. I might have to re-test this recipe another million times or so though. Just for, you know, science. Pour canola oil into a heavy deep pot (a Dutch oven works great for this) until you have about 3 inches of oil. Heat over medium high heat for about 10 minutes or until oil is about 350 degrees. Whisk together flour and salt and add club soda. Dunk the fish pieces thoroughly in batter and using tongs, carefully lower them into the oil. Cook until golden, about 5 minutes. Remove with slotted spoon to a plate lined with paper towels. While the fish is cooking, mash the avocado with the lime juice and a pinch of salt and set aside. Turn on a gas burner on low and lay each tortilla on it for about a minute a side, using tongs to flip it and remove it. 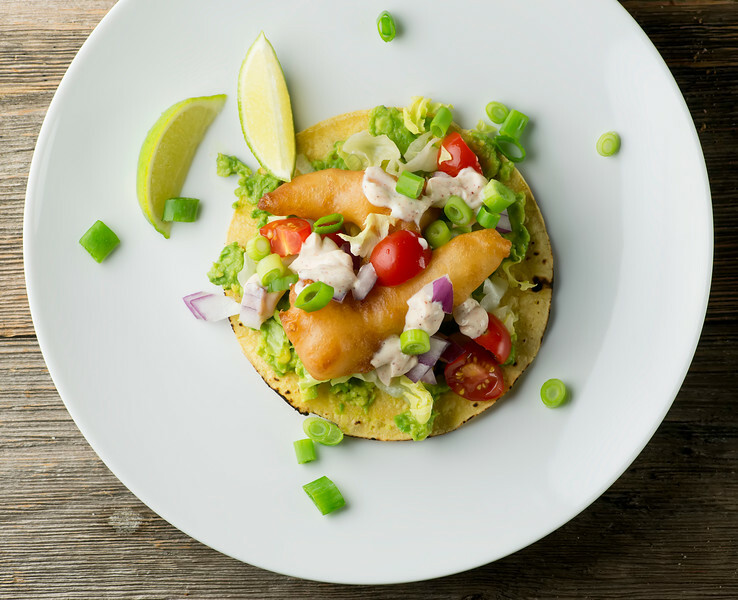 Assemble as follows: spread the warm tortilla with avocado, top with lettuce, fish strips, tomato, scallions and a little chili sour cream. Serve at once with lime wedges. we use cabbage (I like blended white and red) instead of lettuce. It may be a California thing but provides a nice little crunch and doesn’t get soggy. On regular ground beef tacos I’m a lettuce girl but chicken and fish… Cabbage! Give it a go!